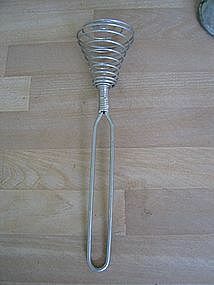 Years ago, one of my sweet little neighbors could make mounds of whipped cream with one of these. I don't know how many 1/2 pints of heavy cream, I wasted trying to make whipped cream with this little beater. No real damage, but does show areas of age related discoloration. I need your zip code to calculate the postage.